Danny Hollands has been ruled up for up to two months with a fractured leg. 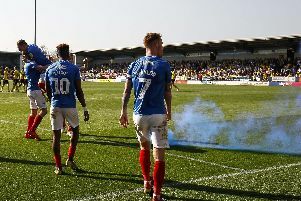 The Blues midfielder was forced off in the 2-2 FA Cup draw at Ipswich last weekend after a strong midfield challenge left him needing treatment. But it’s now been confirmed that the former Bournemouth man has suffered a hairline fracture of the fibula – the smaller bone in the lower leg. Boss Paul Cook said: ‘It’s a big disappointment for us and Danny as he’s been in excellent form lately.